Your first priority at UNM is learning. We have engaging resources that will help you be a more effective learner and enjoy your academic experience at UNM. Whether you like to study alone, in a group, or at weird hours, there is a place and space for you to explore and grow academically. There is a reason you wanted to come to college. To get a good job. To change your community. To think big thoughts. To be around like-minded people. To be an informed citizen. Be strategic in how you stay connected to that goal. College success does not happen by chance. College students typically spend more than 15 hours weekly in class, and you’re expected to study 2 hours per classroom hour. You can expect to spend up to 50 hours per week sitting through lectures and studying. In addition to school work, most students work part-time, participate in extra-curricular activities, and socialize with friends. The best way to stay on top of your responsibilities is to focus on time management! Developing time management and organizational skills is the key to working efficiently. The best way to better manage time is to develop daily schedules. Waste less time, stress less, and succeed in all your academic classes with the CAPS Learning Strategies Program! From acing your tests to balancing your schedule, we have a strategy for your success. There are great places that will help teach you routines and personal self-management to help you do your best in the classroom. Some of your instructors will be full time professors, some will be graduate students, and some will be lecturers. They all have something in common: they want you to succeed in your courses at UNM. If you’re struggling in their course, they can help you get back on track. If you’re interested in learning about cutting edge research, they would love to talk to you about theirs. The key to getting the most from your instructors is starting a one-on-one conversation. The best way to chat with your instructors is to attend their office hours. Each instructor will publicize their office hours at the beginning of the semester. These office hours are for you. Take advantage of them. Conversation Starters: Here are a few conversation starters for when you pop by your instructor’s office during these hours: “Hi, my name is___. I am in your ___ course. I’m doing fine in class, but do you have time to talk about how I can make the most of what I am learning?” or “I am struggling with a specific concept in your class. Could I visit with you about that?” or “I am really interested in a profession in ___. Can you tell me more about what it takes get into that career?” or “I would love to learn more about research. Do you conduct research? If so, could you tell me about your work?” The hardest part of any conversation is getting it started. After you open the door, however, a great conversation will follow! Finding Your Instructor: The first day may have been a blur and you have no clue who your instructor is. Don’t worry. This is easy to figure out! Your faculty contact information will be included on your course syllabus, so be sure to keep your syllabi at the ready all semester long. You can also find more information about your faculty members on the websites of the various academic department. For instance, a directory of chemistry faculty members can be found under the PEOPLE menu on the website for the Department of Chemistry and Chemical Biology. If you’re not sure where to find departmental websites, check in with your academic advisor. They peruse these sights regularly, and know exactly where the important resources are located. College courses are designed to stretch your mind. At various times, nearly every student questions whether they have is needed to excel in their courses. The good news is that you do! But it’s important to understand that few students earn their college degrees alone. 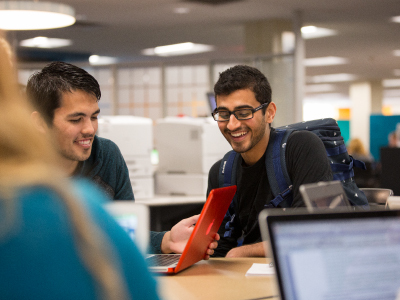 Learning at the university level is a collaborative process, and is best mastered with the support of your classmates. So seek out new friends in your degree program. These students will be in your same courses, and will be working towards goals similar to yours. Together, you and your friends can study smarter, teaching and learning from each other in addition to your instructor. You can remind each other of important deadlines, and share helpful strategies and resources. Studying with friends makes college fun, exciting, challenging and rewarding! One of the keys to effective studying is finding a good location. And you need to know what works best for you. It can be difficult to study in a room full of distractions. But, the best location for you may not be the best study location for someone else. You may not like studying somewhere private, or even very quiet, but you do want to make sure that you study at a location that is conducive to your method of learning, allows you to concentrate, and is free of distractions. UNM’s campus has tons of different places for different people. quiet cubicles, bustling spaces, peaceful outdoor environments, there is something for everyone. Library There are four libraries on Main Campus including Zimmerman, Centennial Science and Engineering Library, Fine Arts and Design Library, and Parish Library. On North campus are the Law Library and Health Sciences Library. Between the courses you take, the major you choose, and your out-of-class experiences, you will find the future you came to UNM to discover. Below are some strategies to use all of your experiences at UNM to enrich your academic journey. Part of growing is being open to change. Growth mindset encourages you to understand that intelligence is not static and you can learn anything. At UNM, seek out like-minded people who will encourage you to keep growing and changing and evolving. In college courses, it is critical that you take ownership of your learning. This means you must ask about what you don’t know, seek clarification, and reach out for help when you stuck. Chances are, you are not the only one who needs help. Your fellow students will appreciate you asking questions in class. Connect to your department or program. Get to know your chair or director. Take some time to connect to the operations manager or admin who will share great tips about how to navigate the unit. Attend seminars, workshops, and colloquiums sponsored by your department. It’s a great way to meet others students and faculty and learn what the latest research is in your field. Open to exploring all of your options at UNM before selecting a major? Faculty love an exploratory student. They often express that this population is open to really listening and applying the knowledge learned to lots of different spaces. Exploratory (EPAC) advisors have received specialized training designed to help empower you to seek and find your path to a field of study. Research opportunities! UNM is a Tier I research university which means we have world renowned research opportunities available to undergraduate students. Where to start? Ronald E. McNair Scholars Program and the Research Opportunity Program (ROP). McNair/ROP programs offer eligible students the opportunity to conduct faculty-mentored research as well as travel opportunities and support during the graduate application process. Undergraduate Research Opportunities Conference features research and creative works by our UNM undergraduate students. Research Opportunity Database This database is designed to connect students who are looking for research opportunities and UNM faculty who seek student assistants in their research projects. Really get outside the classroom: Study abroad! UNM offers excellent opportunities to learn on another campus or in another country. Check out these great opportunities through National Student Exchange and Global Education Office. Experiencing other cultures and communities is life changing. You can often find funding for these opportunities. Don’t miss this! Learn more about the college, campus, and surrounding area. The more you know about UNM, the more you will become a part of the campus community, the more faculty and staff can connect you to resources and new ideas. You can have lots of fun in an academic club or activity. You will meet up with students in your major and make life long connections. Who knows if you’ll start a new business or invention right over a piece of pizza?!? Ask your department about clubs in your field or check out this link. Follow UNM’s social media accounts. This is one of the best ways to keep up to date about the latest research, events, and activities that have put UNM in the forefront of so many important innovations. Disclaimer: This GPA calculator is for unofficial use ONLY. The Registrar's Office of the University of New Mexico is the only official entity which may verify and certify grade point averages for degree completion and other program requirements.